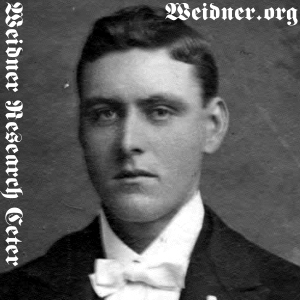 Frank Weidner. Courtesy of Raupp Memorial Museum, Buffalo Grove, Illinois. [S11] John J. Weidner, Compiled Birth, Death, 595, birth date only. [S98] Arlington Heights Herald, 07 Jul 1944, sect. 1, p. 2, col. 3, Birth date, city, state. [S1063] Frank G. Weidner, State of Illinois; Department of Public Health - Division of Vital Statistics; Certificate of Death, Birth date, states he was born in Wheeling Township, Illinois. [S11] John J. Weidner, Compiled Birth, Death, 595, burial date only. [S98] Arlington Heights Herald, 07 Jul 1944, sect. 1, p. 2, col. 3, Death date, street name. [S265] Arlington Heights Herald, 03 Feb 1966, sect. C, p. 15, col. 5, Death year only. [S1063] Frank G. Weidner, State of Illinois; Department of Public Health - Division of Vital Statistics; Certificate of Death, Death date, street name, township, county, state. [S98] Arlington Heights Herald, 07 Jul 1944, sect. 1, p. 2, col. 3, Burial date, cemetery name. [S1063] Frank G. Weidner, State of Illinois; Department of Public Health - Division of Vital Statistics; Certificate of Death, Burial date, cemetery name, township, county, state. [S11] John J. Weidner, Compiled Birth, Death, 646. [S11] John J. Weidner, Compiled Birth, Death, 340, 648.